Buy Buttons! 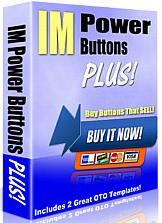 Grab 4 Great Sets Of POWER Buy Buttons - Buttons That Sell.... PLUS More! How would you like to grab 4 great sets of Power Buy Buttons plus a couple special Bonuses easily worth hundreds of dollars in graphic designer fees, for a fraction of the price? Interested? Well, Im not going to spend a lot of time telling you about the special offer I have for you today. Instead, Ill show you. Take a Look at What Youre Getting Below Each Power Buy Button comes in 2 color schemes and 2 sizes. You also get them in .jpg format and .png with transparent background. A total of 32 buttons! These buttons are designed to get the click - and get the sale! Remember, you get all the buttons in both .jpg and .png transparent, for a total of 32 buttons! You also get a great Web 2.0-Style Power Buy Button! Softer colors and fades, yet bold, this will be the new trend in Internet Marketing Graphics. You get this great button in .jpg and .png transparent format. Im also throwing in 2 Hot Off The Presses One Time Offer Templates, brand new, never seen before. These templates, like my others, require no graphic editing and are easily edited in your favorite html editor. A new window will open. Just close it and youll be right back here. To make this even better, the entire package comes with Master Resell Rights! And Ill give you a sales page like this one, along with all the graphics. Good deal? So now youre thinking Hey, thats a great package, but whats it gonna cost me?. Was I close? Impressed? Well, what are you waiting for? Click on that nice big button below and this entire package will be winging its way to you through cyberspace! Fair enough? Great! NOW you can click on that buy button and grab your copy today, before I change my mind and raise the price! P.S. All of these graphics are professionally designed and worth hundreds of dollars at least in designer fees. Grab yours now while you can at this steal of a price!